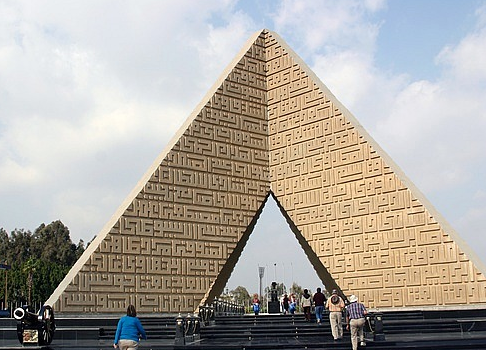 Cairo has a Tomb to the Unknown Soldier, and like the one in the U.S., it is more of an attraction for foreign dignitaries and a few local tourists. The difference is that there are two tombs at the Egyptian version. One tomb holds someone ‘unknown’ and the other holds former President Anwar El Sadat.Two soldiers in red uniforms and dusty black caps stand guard with long rifles. Behind them, past two black Ottoman cannons, are two more soldiers wearing Ottoman garb: gold striped red coats, billowing bright blue pants, and tilted little maroon fezs. Behind them are two more soldiers, in tacky get-ups of Ancient Egyptophilia: white pajamas, gold pharaonic headdresses, and neon rainbow rayon breast-plates. It’s worth fifteen minutes. Read more here.